Don't forget to tune in, or you'll miss out on a new costume for Homer and 10 free donuts. 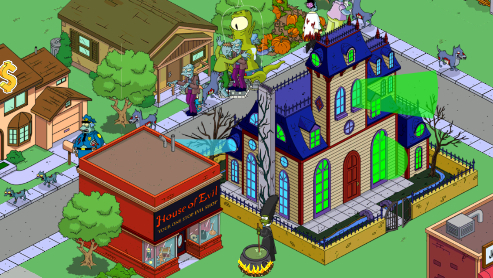 Tonight marks the debut of the much anticipated Simpsons Halloween episode, otherwise known as The Simpsons: Treehouse of Horror XXIII (8:00PM Eastern Time, FOX). That alone should make you excited, but there's an added incentive for tuning in. Turns out, there's a clue that ties into The Simpsons: Tapped Out for iPhone and iPad. Answer the game's trivia question correctly, and you'll apparently unlock a new outfit for Homer, along with 10 free donuts. That said, we plan to watch the show this evening.